Sean and Dorothy Fitzhenry's homebred stakes winner Mr Havercamp was victorious in his four-year-old debut on Saturday afternoon at Woodbine, defeating past winners of the Steady Growth Stakes in this year's $100,000 edition. With Eurico Rosa Da Silva aboard, Mr Havercamp took over command in the stretch of the 1-1/16 mile Ontario Sired Stakes from late leader Keen Gizmo, the defending champion, who finished third this time out as 2016 Steady Growth winner Where's the Widget came on from the backfield to nab the runner-up role. “He's just an amazing horse, I'm just so proud and delighted to be a part of him,” said trainer Catherine Day Phillips after Mr Havercamp prevailed by nearly five lengths in his comeback race over the Tapeta course. Mr Havercamp settled back in seventh-place behind a wall of horses and began to fan wide as Singandcryindubai led the way for the first three-quarters of a mile, setting fractions of :24.52, :48.50 and 1:12.42. Keen Gizmo struck the front turning for home, but Mr Havercamp hauled down that rival in the stretch to score in a final time of 1:43.68. Despite a reported setback during the winter months while in Florida, the Court Vision-Tennessee Lamb gelding exhibited steady progress in recent weeks for his connections and a shoeing issue in the paddock before the race proved to be of no concern. After putting together a debut campaign last year in which he won four of six races including the Vice Regent and Bunty Lawless turf stakes, Mr Havercamp was sent postward as the 3-2 favourite and returned $5.10, $3.90 and $2.90. He combined with Where's the Widget ($13,60, $8.60) for a 9-5 exacta worth $75.20. A $1 trifecta of 9-5-3 (Keen Gizmo, $5.50) paid $262.05 and a $1 superfecta of 9-5-3-1 (Kingsport) returned $956.80. Nipigon rounded out the top five finish order in the field that was scratched down to 10. While Da Silva stole the spotlight in the stakes feature, Rafael Hernandez added to his meet-leading win total by taking half of the afternoon's 10 races. Live Thoroughbred racing continues on Sunday afternoon at 1 p.m., featuring the Grade 3 Trillium Stakes. 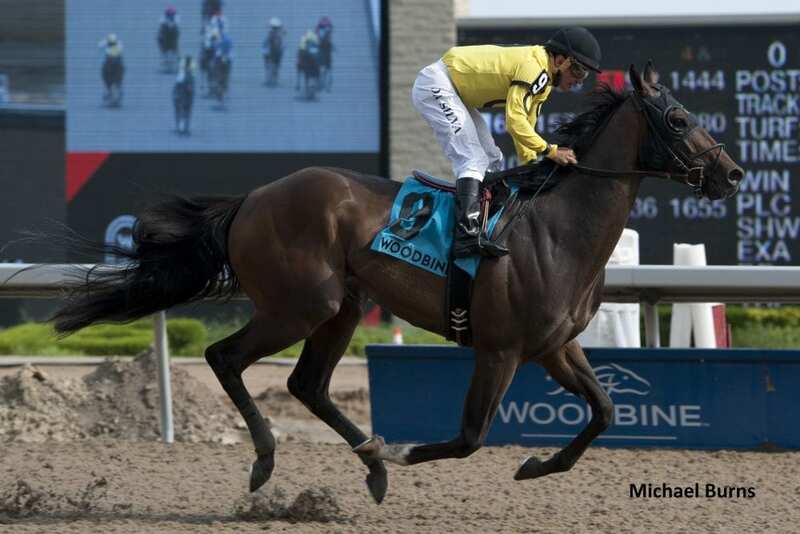 This entry was posted in Racing and tagged catherine day phillips, eurico rosa da silva, mr havercamp, ontario sired stakes, steady growth stakes, tapeta, woodbine, Woodbine Racecourse by Woodbine Communications Office. Bookmark the permalink.